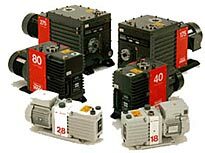 of vacuum pumps, systems, boostersand accessories based on a number of technologies and capable of achieving high vacuums down to 10-7 mbar. Edwards Vacuum pioneered the oil-free ‘dry’ pump, originally for the semiconductorindustry and subsequently for other industrial processes, and now markets a series of dry pumps using claw, roots, scroll and combined mechanisms. Other pumping technologies include rotary vane, vapour diffusion, turbomolecular, cryogenic and sputter-ion.